A break from making bosses, so to speak. In this contest , you must merely design a boss that looks good, it doesn't have to do anything. A theme will be provided for each contest, after conclusion, after which the community shall vote for a victor. Aside from this, the victor and runner-up decide the next contest's theme, the community then votes for the decision of decisiveness. This contest will last thirty days from now, there is no rush, enjoy your application. 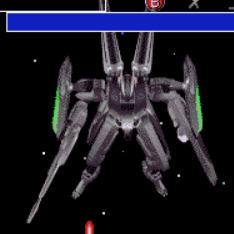 Design a boss from any game/shmup of choice, but with a twist. Enhance it's design so that it's notably different and hopefully looks better, but the old boss is still discernible. Make sure to point out what it's based on. I myself will be participating as long as people apply. NOTE: it's okay to submit images aside from .fed files due to the nature of the contest. Last edited by Deadliar on Wed Jan 13, 2016 1:44 am, edited 3 times in total. Based on Zeladis the Black from Storm Caliber. "Impossibility is simply the highest level of unfair."